Lately I've been sporting a more bohemian look... Across the forehead headbands, suede boots and flats with fringe, feather accessories and wrap bracelets! 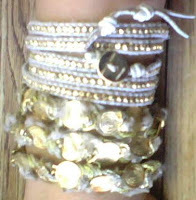 The top wrap bracelet is by Chan Luu. Although she also designs scarves and other types of jewelry, her wrap bracelets have gained popularity as her signature piece and have adorned the wrists of many celebrities including Kate Hudson, Halle Berry, Rihanna and Jennifer Aniston. Luu's bracelets have also appeared in magazines such as Vogue, Elle and Glamour. I received this as a gift and it has become one of my favorite staple pieces. After a few beach outings and swims, it has that perfect worn, vintage look that I love!